So, I don’t know from which angle to approach this post. The important thing to know is that Venus is about to put on a show for us. The second planet will be crossing in front of the sun for several hours in the afternoon. This only happens once every 105 years, so not again until 2117. I am feeling like a lot of once in a lifetime events are occurring in 2012, but that’s an apocalyptic post for another time. This eclipse is called the Transit of Venus, which sounds like a Kama Sutra position and it probably is. Okay, back on topic. Astronomical phenomena always gets Captain Jackson a little geeked because it gets me thinking about what our ancestors might have thought the event signified. Venus has historically represented love and relationships and word on the street is these eclipses coincide with significant scientific breakthroughs. Space.com has a pretty neat article about the significance of these transits. Oh yeah, one of the proper names of people who live on Venus is Venerials, hehe. I can’t possibly imagine why that didn’t catch on. Start looking up around 6:00PM on Tuesday, but only if you have the proper solar viewing equipment. Yes, apparently, it is true that you can damage your eyes by staring at the sun.¹ Don’t do it, please, don’t do it. Drake. If you check back on Tuesday, and I think you should, here’s some theme music. I had to post this because dude looks like a full on Star Trek TOS villain. 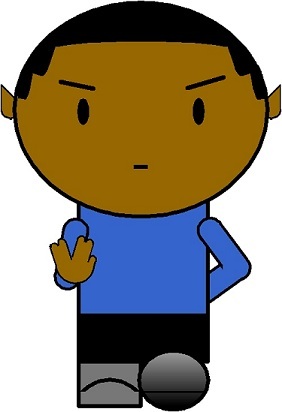 Captain’s Log: Can we get a new black character in the next Star Trek movie?